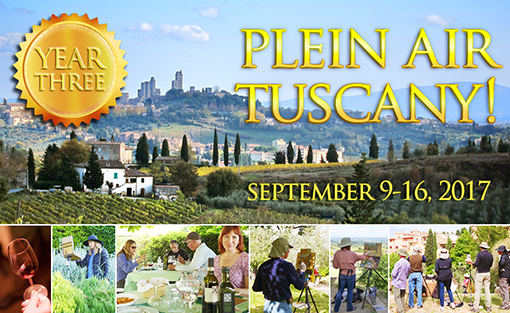 Join me for my 3rd Annual Plein Air Tuscany workshop in the beautiful hills of Chianti outside of Florence!…Eat, Drink, and Live like an Italian as you become a better outdoor painter! Note: If you register by July 15th you will get the Early Bird Discount! Hey Everyone! I can offer the Early Bird Rate for this workshop until July 15th. – At this rate, your workshop instruction and lodgings will range from €2100 to €2900, depending on your choice of accommodations. There are single and double occupancy rooms available, with and without a private bath. There are also several self-contained apartments on the grounds if you prefer more privacy. Your actual US cost will depend on the international exchange rate at the time you register and the type of accommodation you reserve. Airfare is not included and a €600 deposit will be required to reserve your space. Paint en plein air in the sun-drenched countryside of Tuscany. Take your outdoor landscapes to the next level. Stay in a remodeled country farmhouse with sweeping vistas over the hilltop town of Certaldo, where you'll be near Florence and San Gimignano, places we will paint. This workshop is open to the beginning-to-intermediate oil painter and Thomas will offer six hours of instruction a day. 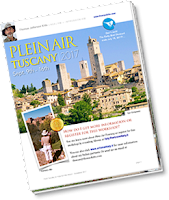 We will take numerous trips to vineyards, farms, and ancient hill towns so you will paint the history and culture of Tuscany. And each day will end with the group enjoying the pleasures and comfort of outdoor dining, overlooking the countryside, and sleeping in a comfortable bed at night. Your week will culminate in a private tour in Florence of the Macchiaioli Painters, the little-known plein air painters of Italy, exhibited in the Palazzo Pitti – followed by the rest of the day spent touring or painting in the streets of Florence. You won't need a car for any of these this trips. We will take you everywhere you need to go! 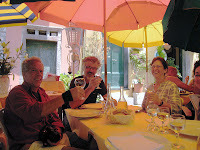 This workshop is a fantastic way to experience the heart and soul of Italy while you concentrate on your outdoor painting skills. It is an opportunity to create new friends and treasured memories of a lifetime!